Visibility/Location: The location was an old warehouse on the edge of Elgin. There was ample parking across the street from the attraction. Wait Entertainment: There was no line, so no wait entertainment at all. Crowd Control: No one was inside when we walked through, so this didn�t come into play..
You know, there are times when you just expect more. And, as I walked out of Evil Intentions in Elgin, I just expected more. That�s not to say there was anything REALLY wrong with the haunted house in Elgin. But it is to say that it was just a strange let down on the night I visited. First, we pulled into an old warehouse area in the 900 block of Grace Street and found the parking area pretty easily. There was one sign pointing us in the right direction off the main street, which helped us find our way. Then, we crossed the street to the front entrance area, where two guys were standing under a pop-up canopy that also had the rules. They were cordial enough and pointed us in the right direction and we made our way toward the entrance. The warehouse was definitely creepy, and the people at Evil Intentions did a good job of using the natural aesthetics of the building to give you that feeling of walking into a haunted house. That�s the thing about old warehouses � old warehouses are just creepy in their own right. With the numerous dark windows, the brick fa�ade, the stains and warped/old paint, on old building like this is just plain creepy. Any haunt owner lucky enough to get their hands on an old warehouse to build a haunt has a true treat, and should definitely use those aesthetics to their advantage. I�m glad Evil Intentions did. I was also pleased with the price of admission. I�m a firm believer that haunted houses should not cross the $20 threshold, and its nice to see that this haunt only cost $15. I don�t know what happened prior to my arriving for the night, but there was barely any actors working when I went to Evil Intentions. 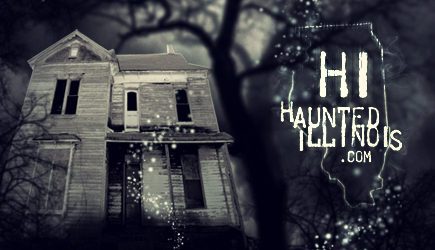 Basically, Evil Intentions Haunted House is two warehouses and about 20 rooms back to back. Throughout the haunted house, there are eclectic rooms of different sizes and shapes. The designers did a great job of building mostly industrial themed rooms throughout the haunt, using the natural characteristics of the old warehouses to generate ideas. For example, one of the coolest ideas was a stairwell in the old warehouse that looked like it was straight out of a horror movie. I walked in, and the lights were extremely bright from the top of the stairs to show you the way to go, and to show you the stairs that are there. But, it was pitch black in the basement so, you looked down the stairs into ominous blackness, and you had no choice to ignore the goose bumps crawling up your arms and walk down. 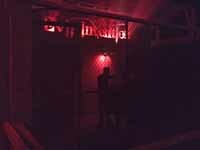 Another thing I enjoyed was the designers created strange �coffin hallways� that people had to walk through. They weren�t very long � maybe 20-feet or so � but it�s kind of cool to walk through a hallway that is shaped like a coffin. I also enjoyed a pallet maze they created. It wasn�t so difficult that we couldn�t find our way out, but the way lights were bouncing through it allowing me to see the other side was a bit overwhelming on the cool side. But, like I said, it seemed like no one was there. Maybe it was an off night for Evil Intentions, or maybe haunted house actors were on strike in Elgin that night, but there was such a minimal amount of actors inside the haunt that I would walk for a minute or two and not see a single person. Worse, in some exceptionally larger rooms, there would be one actor clearly unaccustomed to the room, and doing a poor job of trying to keep me entertained. How bad was it? At one point, I walked from the top of the stairwell in the first warehouse until I made it outside and entering the second warehouse and only bumped into two actors: one was wielding a gas chain saw as I made my way outside, while the second stood just past him, and without saying a word, just pointed to the second warehouse. Then, we went inside the second warehouse and through two more rooms before we saw another spook. I mean, it was really noticeable how little acting there was inside. Now, here�s the thing, I know this wasn�t designed to be like this, so obviously SOMETHING happened that forced such a staffing crisis. I�m not sure if spooks went on strike for the weekend, or if the high school had homecoming that weekend and all the spooks were going to the dance� I don�t know. What I do know is that the place was empty. Honestly, I�d estimate there was maybe 15 to 18 people working in the building the night I attended� and honestly, it was just way understaffed. Now, also, I had some serious concerns about the people that were working inside on the night we went. More than once, the spooks simply stared and growled at us as we walked through, which is an easy out for any spook. However, there was one incident that was completely on the opposite extreme, and actually made me seek out the owner after I exited to tell him what happened. We were walking through the second warehouse when we stumbled into a makeshift hospital. Inside, there was a guy who was sitting in a wheelchair and he sort of rolled up, semi blocking the path, and growled. So, I sort of shrugged and said �Come on�� In character, he said, �Get out of here�� and I said, �Finally, someone interacts with me�� He growled louder and said, �I�ll interact with you�� and semi-chased me out of the room. This was fine, no problem. But, in the next room, it was the insane asylum area � I guess � and there were a couple or three girls in there. One blond was screaming, �Get out� at my group and � WAIT, I must say first that I hate the statement �Get out� in haunted houses. As a realist, I figure if you really didn�t want me here, if you really wanted me to �get out,� you wouldn�t build pneumatic driven props, charge me $25 bucks to walk through, then stand around and wait for an idiot like me to walk in. You would find a place that wasn�t so busy in October to hang out at, a place where you wouldn�t have to tell 1,000 people on a Saturday night to �get out� of. Seriously, if you are reading this, and if you work as an actor in any haunted house, I want you to do yourself a favor: take the next two minutes to come up with something else to say other than �Get out�� By doing that, you will honestly do yourself � and any haunt � a huge favor. Anyway� so she�s yelling get out, I�m trying to wander out, when a second girl lets two of the three members of the group out of the room, but then moves and stands in front of the door, preventing me from leaving. At this point, the guy looked like he wanted to fight. Now, a small, tiny part of me hopes that the guy was still in character and playing around. But a much larger part of me thinks he was pissed and really wanted to fight. What bothers me about it is that I was extremely respectful in the haunted house. I didn�t do anything with the girls � or anyone else as a matter of fact - and it was the girls that put me in a situation where I was blocked from getting out. I followed the rules they laid out � no touching the actors � which is why I was leaning against the wall and waiting for teen number 2 to get out of the way. So, there was absolutely no reason for him to be mad at me. At the same time, if he was in character, then that acting was crap. What he did wasn�t scary in the least, it was just combative. And, for those of you wondering � being combative isn�t scary, it�s stupid. I spoke with others about the issues I experienced at Evil Intentions and, in the end, they said they have never had a problem like I described. They said the haunt has always been full of actors and were genuinely shocked at the idea that I went two or three minutes � through the entire basement � without seeing an actor. In addition, the people I spoke with said they have never had an actor as combative as the one I described � and never have they seen a time when an actor didn�t react to them � where they would just lean against a wall and point or growl. And, on top of that� the owner being in costume shows me he either loves working in the haunt, or he�s short handed and has to be inside. All these reasons tell me the issues I had going through Evil Intentions in Elgin was a fluke. I mean, they were almost DRAMATICALLY under staffed � to a point where it was clearly an epidemic. There were spots where you KNOW a ghoul should be, and no one was there. In total, I estimate that there were between 15 and 18 people working in the haunt that night, way lower than there should have. So, bottom line, I think I need to give Evil Intentions an incomplete. I mean, I could see how the haunt would be one of the better haunts, and it has all the makings of being outstanding, but on the night I went through� it just completely missed the mark with my group BECAUSE there just weren�t any actors. And, from what I understand, that so isn�t like them.